When we were visiting the kids in Florida, we went fishing off the Skyway Bridge Fishing Pier and we inadvertently “caught” a gull. It flew into one of the lines and became tangled. 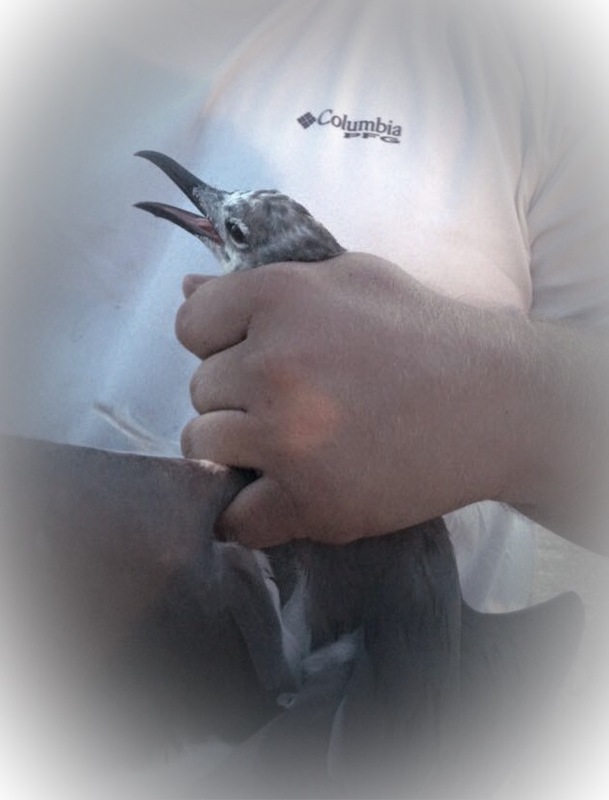 We were fishing with a Florida fishing expert, and Adam quickly pulled the bird in, restrained it, and worked to remove the knotted line from around the bird’s wings and body. There was NO part of this process that the bird enjoyed. It was frantic with fear, and frankly I couldn’t blame him one bit. I mean, one minute he’s targeting a fish that was, for some strange reason, flying off of a bridge into the Bay, and suddenly with no warning, life is a hot mess. Some invisible force is trying to pull him out of the air, into the water. No matter how much he tries to fly away, his wings just aren’t working right, and there is pain to top it all off. Just when it seems like it can’t get any worse, a person grabs him by the neck and starts trying to kill him with their bare hands. At least, that’s what it must have seemed like from the bird’s perspective. We tried to calm the bird with gentle words and Adam and Paula worked quickly and purposefully to save the bird from a painful and certain death. But the bird didn’t know that, and he was afraid. As we approach the end of this calendar year, some of us may find ourself “caught in the fishing line.” Circumstances that seem hard and perilous aren’t changing, if anything they seem to be worsening. Maybe it’s the fishing line of sickness, or financial insecurity, or relational conflict, or addiction, or… We look around and the only things that are visible, all that we can see within our field vision breeds greater fear and dread. Ah, but here is where the difference happens. That night on the bridge, we didn’t have any way to communicate to the bird that it had nothing to fear, that we were in the process of providing a permanent solution to his problem if he would just trust us for a few moments. But, in our lives we DO have the assurance that we need not be afraid, because a Savior has come into this world and salvation is at hand. We have the promise that we are in our Father’s hand and His plan is to prosper us, not to harm. I don’t know about you, but I needed the reminder that I do not need to fear the future, that what is unknown to me is well known by my Father, and what time I am afraid I need only to trust in His loving care. The bird flew off, unharmed, but could have suffered even less had he been able and willing to trust and not fear.